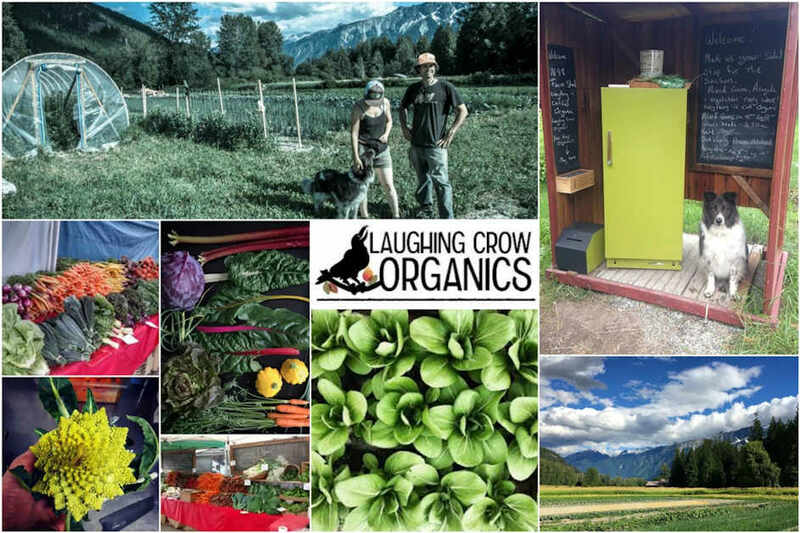 The first Pemberton farmers that we are featuring in our Pemberton Farm to Table Feature is Laughing Crow Organics. Laughing Crow is the collaboration of Kerry McCann & Andrew Budgell and is situated 3 and half kilometers up the Pemberton Meadows. Andrew and Kerry and their produce can be found at the Whistler & Squamish Farmers Markets as well as at the honour stand at the entrance to their farm. They also offer weekly harvest boxes delivered to your door in either Pemberton or Whistler. "As business partners we have found traction in our mutual goals and enthusiasm for Certified Organic vegetable farming. Each of us were looking for a way to create a livelihood that could give back to our community, allow us to work for ourselves and would not create a larger burden for our future generations to inherit. The farm is the vessel for this mutual ambition. We started the farm in 2013 on a tight budget and a lot of hope. Now in our 5th year growing, we continue to gather inspiration from our surroundings, the food we grow! And the amazing people and businesses who support our efforts to farm. Laughing Crow Organic Farm is a quality driven project that never compromises on promises of freshness and variety." In order to help you access what their farm has to offer this year, you can purchase a share of the harvest goods prepared in the form of a weekly harvest box. The box will be delivered to your door every week in Whistler or Pemberton.Their program will run for 17 weeks (beginning at end of June). The first half of payment ($255) is due by April 31st, The second half ($255) due by August 12th, For a total of $510. What you get: Every week you will receive a box full of delicious Organic Pemberton veggies. Recipes to help you enjoy the food as well as newsletters to keep you updated on the Pemberton farming season (bees, bears, collies, fields and vegetable drama) are sent out as often as possible to the membership. Laughing Crow also offers market shares which offers great flexibility. Market shares are purchased online and allow you to support Laughing Crow while getting your produce at a 10% discount. More information on this program can be found here. Here's an idea of what you can expect from Laughing Crow over the growing season. Early summer: Mixed greens, Kale. Napa Cabbage. Carrots, Beets, Radish. Spinach, zucchini, Cauliflower, Broccoli. Chard. Collards. Turnips. Lettuce. Peas. Choi. Garlic scapes. Green onion. Mid-summer: Mixed Greens. Kale. Chard. Collards. Peas. Turnips. Cabbage. Broccoli. Cauliflower. Beans. Fennel. Herbs. Basil, Cilantro, Cucumber, Carrots. Beets. Zucchini/summer squash, Potatoes.